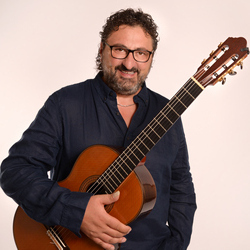 Aniello Desiderio is an Italian classical guitar virtuoso and a teacher, a professor at the Conservatorio Di Musica S. Giacomantonio in Cosenza. He is known for his intricate touch, speed and precision on the instrument, delivering “acrobatic arpeggios and scales of extraordinary brilliance”, which has led to comparisons with Paganini. He is particularly renowned for his interpretations of Paganini, Scarlatti, Carulli, and less known Italian composers on a world scale. He graduated in 1992 from the Conservatorio Antonio Vivaldi in Alessandria. Desiderio began performing outside of Italy in 1989 at the International Guitar Festival in Volos, Greece, and has since played concerts worldwide – in Norway, Canada, Germany, Croatia, United States, Turkey, Romania, Austria, Spain, Greece, Mexico, Indonesia, Luxembourg, Brasil, France, Slovenia, Switzerland, Denmark, Colombia, Poland, Venezuela, Portugal, Georgia, Russia, South Korea and Thailand. He has been invited as a guest to perform at many festivals, including Musikfest Bremen, Ludwigsburg Castle Festival, the Rheingau Music Festival, I Pomeriggi Musicali, the Scarlatti Festival and for Radio France. In 2000, Desiderio was a soloist at the 70th birthday celebrations of Lorin Maazel. He released a CD, “Italica Famosa”, which was nominated for a “Golden Guitar” award for best CD of the year. Desiderio co-founded the World Guitar Ensemble, a group consisting of 10 classical guitar virtuosos. The following year, he formed the baroque-tango fusion group, Napoletanissimo, with his brothers Gennaro and Gaetano, as well as other Neapolitan musicians, which toured the United States; the group was renamed the Quartetto Furioso in 2008. Along with his brothers Gennaro and Gaetano, he established another group, which mixes baroque and tango music.